Virat Kohli on Win Over England. "Couldn't have asked anything more and especially after winning the series 3-0 and performing like this. 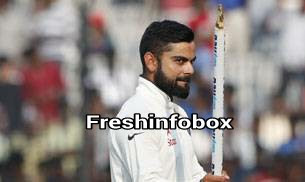 It's an evidence of the character of this side and what the guys prepare like for a Test match, playing for the country," Kohli said in the post-match presentation ceremony. "They take a lot of pride and it was evident in the way we batted and bowled. We wanted the youngsters to do well. KL Rahul had a good domestic season but didn't have a great outing and then came back and almost got a double century. Karun didn't have two good Tests and then does this (an unbeaten 303)." "It's always tricky when you have scored 477 and then concede a lead of 282. Mentally and psychologically, it is always a dent. We knew that. "We realized that once we got a couple of wickets, it will be a downward slide. They don't want to be ina position after getting so many runs and be in a losing position. Jadeja did the job in both the innings. Hit right areas and made it uncomfortable for the batsmen. Intensity was top class," Kohli said. "Very proud. Toss and pitches were out of the equation. We were up against big totals and we won by an innings. Doesn't happen too often in Tests. We work hard everyday and believe in us. We don't care about what's happening outside; what matters is what each one of us thinks about the other. There's lot of respect and friendship in that dressing room and it's evident on the field. Nobody is playing for himself. Every time we were put under the pump, we have tightened up on giving away wickets at crucial time, especially after intervals. We have improved on that. "The lower order has deflated the opposition, scoring 200+ three times, and their hard work in the nets showed. Our pace was quicker than theirs, even the consistency was better, and it was very proud moment for me as an Indian captain, seeing the fast bowlers stepping it on. Kudos to the hard work they have put in in the past few months."